I've been a bit inactive on my blog the past week due to illness. Hopefully I make up for that now. 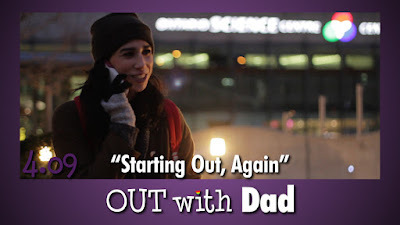 I'm not shifting my topic from last post, as I continue to report on the success of Out With Dad (still my favorite webseries) season 4. And by success I mean that the season just keeps getting better! Let's start today with episode 4.09, Starting Out, Again. In this episode both Nathan and Rose are looking for love. Or it's looking for them. This episode feels like the installments in previous seasons to me more than any in season so thus far. I think perhaps that's because we're seeing events that propel the storyline forward towards an unknown future, as opposed to events that tell us of the past. This is the great interaction between Nathan and Rose that we all know and love! Smart, funny, and compelling! But also, and most importantly, we have the return of "head Rose" and "head Nathan"! This is one of the little touches that makes Out With Dad so captivating and unique! First, there's Nathan reuniting with old (but unfamiliar to we viewers) flame Valery. Nathan is hopelessly goofy and hopeful in his encounter. It's also nice that, as opposed to previous romantic interest Angela, Nathan tells Rose about the encounter right after it happens. Though he is still concerned about Rose's feelings about him dating. Sigh. Get over it, man! Then we have shaved-dead-girl and Rose. I will admit being prejudiced against shaved-head-girl at first because...well...she has a shaved head. Or at least a partially shaved head. Anyway, to an old person like me that's just not very mainstream-seeming and it scared me. However, in her debut we did not get to hear shaved-head-girl talk and didn't really get to know her. And she seemed a bit forward flirting with Rose. I think that put me off, too. Anyway, once we get to hear shaved-head-girl talk to Rose (conveniently due to her calling right when it fits into Rose and Nathan's discussion) she sound really nice and cool. So now I like her! Just shows you should not judge people by the first appearance, huh? Anyway, things look positive for a future between Rose and her new flame with an old name. In fact, I will now make sure I do not call her shaved-head-girl. That's silly anyways. I shall refer to her as Vanessa II. 'Cause that's not silly at all. There's also Nathan's comments on Owen and Nathan's fear that Rose is slipping away. Funny. And finally, Nathan's response to Vanessa II's name, which is priceless!! But now to discuss the continuing tale of Vanessa I. The original and never truly duplicated Vanessa. 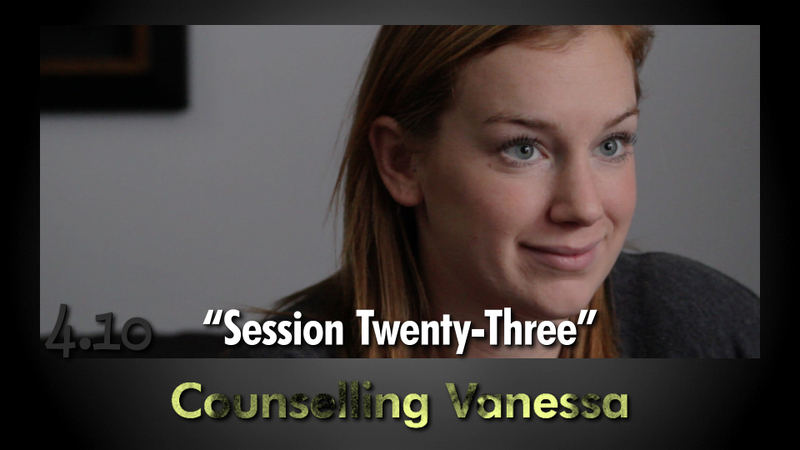 IAs we see Vanessa in session 23 of her counselling, we hear her speak of her mother. The statement she makes that hit me the hardest was when she says that she's how there are people like her Mother still in this world. That's something I can agree with. I know a lot of prejudice goes back generations, but we live in such a time of communication and understanding. We aren't living in isolated tribes where outsiders are probably going to kill us. Yet some people won't give up the us-versus-them mentality. And even if I'm a little prejudiced against young people with weird hair, I don't hate them. I wouldn't deny them rights. And I could befriend them, I'm sure. Even though I'm gonna keep my hair just like it is. And Vanessa's an Aunt! Not only is that cool, it gives us a chance to see Vanessa (and Lindsey) smile! Episode 4.07 of Out With Dad is called "Out Clubbing" and it revolves around Rose and new/old friend Owen recapping their night at some night spots. The main thrust of the episode is getting Rose to admit she'd like to date someone, since it has been 3 years since the Claire/Vanessa debacle. Rose tries to set up Owen with a date of his own and he agrees if Rose will try to get a date with a girl she met in a club. That's really about it for this episode, except that the conversation is very interesting, fun, and realistic. This is truly a change of pace from the previous episodes of this season and I liked it a lot. I see that fans are still upset at the pace of this season, but this looks like it will shake things up. Oh, and Rose asks "shaved head girl" out for tea. Tea! A OWD staple! And now we turn out attention to Vanessa. 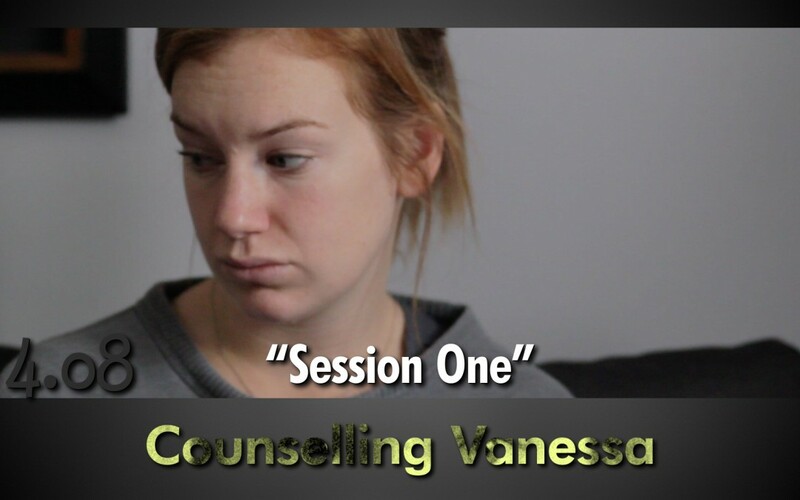 Set shortly after the end of season 3, Vanessa seeks counselling on her Father's recommendation to deal with the traumas she endured after running away. We find out why she didn't return to school, and we find out how afraid she is. This episode sets the stage for the future of Vanessa. Lindsey Middleton is sad and somewhat creepy in her portrayal of Vanessa in this episode. It seems almost too real, and it really shook me up after seeing this one. This is also a bit of a shock after the light-hearted "Clubbing" episode discussed above. I'm not sure what else to say but, my does creator/writer/director Jason Leaver come up with some engaging stories! Lucky for me there's more out right now to watch! !